Will Olson, a beekeeper and an online school teacher, says bees have become so valuable to agriculture that it's led to a surprising byproduct: bee thieves. As fluffy snowflakes dust fields northeast of Deer Park Saturday afternoon, a man in a yellow-and-black-striped hat finishes loading colorful wooden boxes onto his flatbed trailer. Will Olson crunches through the fresh snow as he secures the 30 or so beehives that spent the summer here on a friend's rural property, a few miles off Highway 395. He fastens bungee cords to the flatbed, tightens ratchet straps and makes sure the bright red and yellow tin-can lids that serve as hive doors are covering the entrance to each box. Soon, his bees will be joined on the trailer by another roughly 30 hives that belong to a friend, and Olson will leave at 3 in the morning to make the long drive down to sunny Los Banos, in California's Central Valley, where 60- to 70-degree weather waits. There, the hives will be rented out to different crop owners throughout the winter to help with pollination, chief among them the almond groves. Each hive that's survived to this first weekend in November can contain as many as 40,000 or 50,000 bees, Olson says. Even so, that makes his trailer load very small in comparison to the many operators who help roughly 2 million hives migrate to California every single year. "I am a very small scale. Most guys would laugh at this much effort for what I have," Olson says. "But I do it because I love them. I love honey. I love bees. I love nature." Over several months, the bees may help with mustard blooms, peaches, apricots and cherries, but the almonds are really the main draw. California produces 80 percent of the world's almonds, and 100 percent of the commercial supply for the United States, according to the Almond Board of California, an agricultural promotion group approved by the federal government. In 2015, the state exported $4.5 billion of the tree nuts. North America and Western Europe make up the lion's share of the almond market, with 65 percent of California exports going to just 10 countries, according to the Almond Board's 2016 annual report. 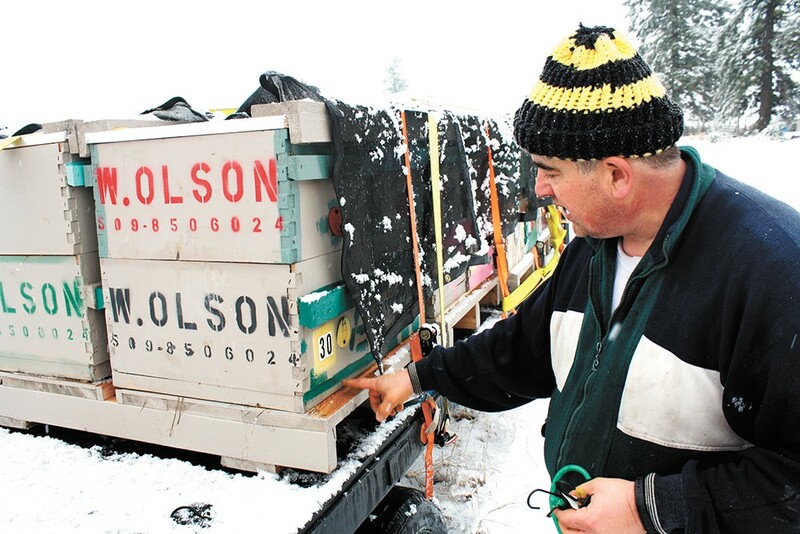 To meet that demand, farmers rely on beekeepers like Olson, who they pay a rental fee to keep their hives on the farms for three to four weeks, usually starting in February. He's been beekeeping in Eastern Washington for about 10 years, and got connected with the business through a beekeeping friend whose brother makes a living transporting hives between California farms. Olson says the fact that it's lucrative has led to an interesting problem: bee thieves. "They've had a lot of problems, actually, with bee rustling," he says. "They'll show up in the middle of the night with a semi and a Bobcat — these are all on pallets — they fork 'em up and they're gone in 20 minutes." To dissuade that type of theft, one company has even devised a GPS tracker that can be embedded in honeycomb frames. As a small operator (without a GPS budget), Olson hopes that a spray-painted "G P S" on the side of each box will at least make potential thieves think twice. Olson grew up in California, so the trip doubles as a chance to spend time with family in the area. When he brings his hives back in the spring, he also gets the chance to profit again. "The big event in beekeeping is in April — that's when people here want to buy their hives, and new colonies," Olson says. "That's when people bring hives from California here, so that's the other part of my business: I bring back packages for wholesale." For those who don't want to keep bees, but want to help ensure the essential pollinators thrive, Olson says the biggest thing people can do to help is to allow beekeepers to put their hives on their rural properties.